This panorama was acquired on sols 652 to 663 (23 November to 5 December, 2005), as NASA´s Mars Exploration Rover Opportunity was exploring sand dunes and outcrop rocks in Meridiani Planum. The panorama originally consisted of 635 separate images in 4 different Pancam filters, and covers 360 degrees of terrain around the rover and the full rover deck. Since the time that this panorama was acquired, and while engineers have been diagnosing and testing Opportunity´s robotic arm, the panorama has been expanded to include more than 1,300 images of this terrain through all of the Pancam multispectral filters. 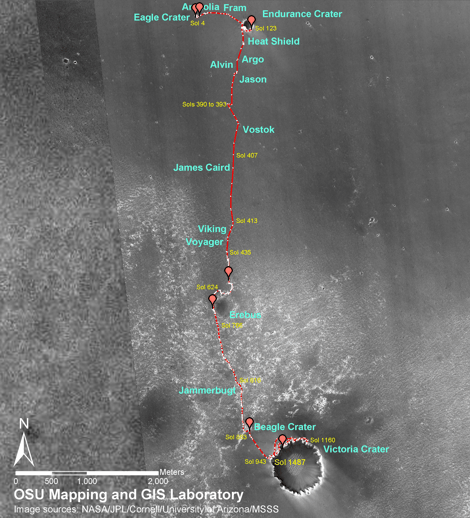 It is the largest panorama acquired by either rover during the mission. The panorama shown here is an approximate true-color rendering using Pancam´s 750 nanometer, 530 nanometer and 430 nanometer filters. Image-to-image seams have been eliminated from the sky portion of the mosaic to better simulate the vista a person standing on Mars would see. This panorama provides the team´s highest resolution view yet of the finely-layered outcrop rocks, wind ripples, and small cobbles and grains along the rim of the wide but shallow "Erebus" crater.